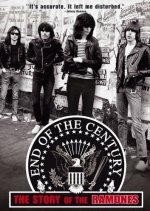 Ramones: End of the Century release date was Thursday, September 9, 2004. In 1974, the New York City music scene was shocked into consciousness by the violently new and raw sound of a band of misfits from Queens, called The Ramones. Playing in a seedy Bowery bar to a small group of fellow struggling musicians, the band struck a chord of disharmony that rocked the foundation of the mid-'70s music scene. This quartet of unlikely rock stars traveled across the country and around the world connecting with the disenfranchised everywhere, while sparking a movement that would resonate with two generations of outcasts across the globe. Although the band never reached the top of the Billboard charts, it managed to endure by maintaining a rigorous touring schedule for 22 years.